Fender bender repair jobs are a big part of our business. 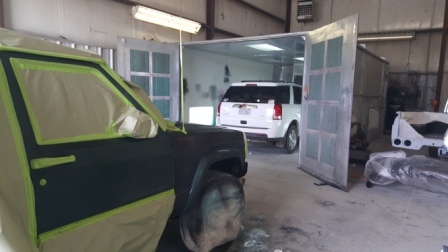 TD Customs is a full service auto body shop, so while we do many custom paint jobs and restorations, we also focus on the smaller fender bender repair work that you need. Dents, dings, scratches, rust, paint fading, part replacing – we do it all! If you’ve gotten into an accident, call or bring your vehicle in to us for a free estimate, and we’ll be happy to get you on the schedule. We do so many cool custom paint jobs and classic restorations that sometimes people think that is all we do. Not the case; we are constantly doing little fender bender repair jobs while we have the bigger projects going on. Fender bender repair work doesn’t take as long, so we can easily get them in and out in just a few days time. We are also one of the most affordable auto body shops in the Asheville and Hendersonville areas. These fender bender repair jobs often involve the same type of work. The damage is either so extensive that we need to replace the parts, or they are minor enough that repairing them is more cost efficient. Tim will be able to determine what is needed to fix the damage in your situation. He works hard to save customers money when he can, so he will figure out which route is better – repairing the damage to the current parts, or just replacing them. The type of repair work needed will depend on the damage. Repairing body damage often entails repairs such as pulling a dent out with a Uni-Spotter, patching in fiberglass or steel where there are holes, contouring Bondo to the original lines of the car, sanding it smooth and repainting it. We will do whatever is needed for your specific repair. Lastly, all fender bender repair jobs will include a fresh paint job over the newly repaired or replaced parts, and will match perfectly. In cases where paint may have faded over the years, Tim will blend the new paint so it matches perfectly. If you have any questions about how would handle your repair, don’t hesitate to ask. 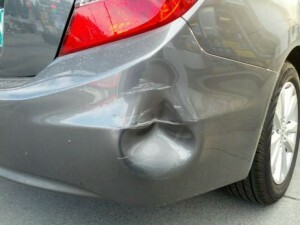 Why bring your fender bender repair to us? We are a full service auto body shop, so we take care of every aspect of your fender bender repair. This includes ordering new parts, repairing damage, rewiring, getting an exact paint color match. Our turnaround time for fender bender repair jobs are fast, usually a couple days. We aim to get you back on the road as soon as possible! We are an affordable auto body shop. Our prices are extremely fair, so we encourage customers to get a couple estimates. We are a small business that puts customer satisfaction first, and will do whatever it takes to make sure you’re happy. We have extensive experience in all kinds of auto body repairs, including fender bender repair work and custom paint. See our Photo Gallery for pics of our work. Will we take insurance claims? Yes, we have helped many customers get their fender bender repair work done through insurance claims, and are happy to work with your insurance company to get the job done. Many times, insurance companies will have preferred shops, but if you would like to use TD Customs for your insurance claim repairs, just tell your insurance agent and they will send an adjuster out to assess the damage and provide an estimate for repairs. You are entitled to choose whatever body shop you’d like to get your auto body collision repair work done. TD Customs is located in Mills River, NC, just down the street from the Asheville Airport. We provide Asheville, Hendersonville fender bender repair work in all surrounding areas. Contact us for a free estimate on your fender bender repair, and we’ll get you on the schedule! See our Collision Repair Services page for a full list of our services. If there is anything you’d like to discuss further, just give us a call. We always aim to accommodate! No Replies to "Fender Bender Repair: We'll get you in and out!"